After directing Nanban, the Tamil remake of Three Idiots, Shankar is now getting ready to make his next Tamil film titled I. It will go on the floors on July 15. Vikram, Suresh Gopi, Samantha and Ramkumar (Prabhu's brother) play the main roles in the film. For the first time, successful dialogue writers Suba (D Suresh and A N Balakrishnan) are writing dialogues for a Shankar film. It is also the first time national award-winning cinematographer P C Sreeram will be working for Shankar. Music is by A R Rahman. A song written by Kapilan and sung by Vijay Prakash has already been recorded. The Australian company Rising Sun Pictures, that did the special effects for the Harry Potter series, is in charge of the VFX. Costume designer of the Men in Black series, Mary Vogt, is designing special costumes. Aascar V Ravichandran, producer of blockbusters such as Anniyan, Ramana and Dasavatharam, is the producer of I.
Suriya's career changed dramatically after he acted in Gautham Vasudev Menon's Kaakha Kaakha. They came together again in Vaaranam Aayiram. 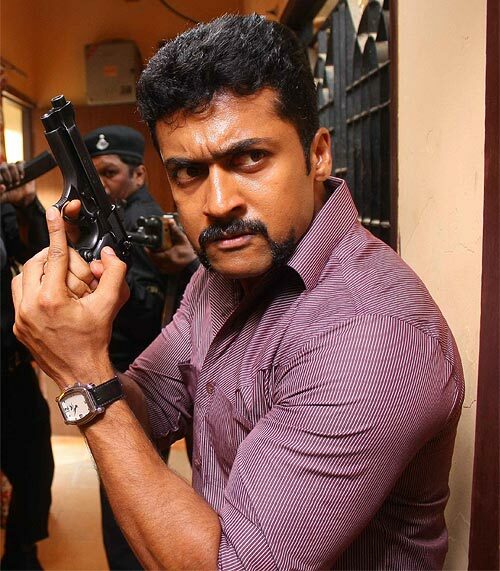 Now they join hands in Thuppariyum Anandhan, in which Suriya plays a cop. The film is produced by Menon's Photon Kathaas. Menon will direct this film after he completes Yohan which he is making with Vijay. Suriya says, "When Gautham and I come together, people expect romance, great songs and action." Says Gautham, "I am really excited that Suriya has come on board to do Thuppariyum Anandhan with me. This will be an action adventure in a contemporary style period film. All cliches associated with making a period film will be broken with this effort." The producers say that Thuppariyum Anandhan is likely to start filming in early 2013. After having acted with Trisha in Abhiyum Naanum and Anushka in Damarukkam, Ganesh Venkatramanm has now been signed to play opposite Shriya in a Tamil-Kannada bilingual titled Chandra. Interestingly, the film will also be Ganesh's Kannada debut. The movie is about the life of a princess played by Shriya, and her two love stories. Other than Ganesh, who plays a charming and suave US-based NRI, popular Kannada actor Prem is in the film. The film is directed by award-winning filmmaker Roopa Iyer. On selecting Ganesh, she says, "I wanted someone who was tall and handsome and also a powerhouse of an actor, for that particular US-based character, who would also be Shriya's pair. Ganesh fitted the role to a T."
The film will be shot in America as well. Ganesh said, "I am excited about Chandra. When Roopa narrated the script, it was fascinating and I immediately gave my nod." Ganesh's upcoming releases are Pani Thuli in Tamil and Damarukkam inTelugu with Anushka and Nagarjuna.